“Scotland Slowly.” The perfect name for a leisurely Adventure Canada voyage among the historic, wind-swept and picturesque islands along the west and north coasts of Scotland. These sparsely inhabited islands are famous for their geologic wonders, Viking and Neolithic monuments, abundant bird life and world-class whisky distilleries. 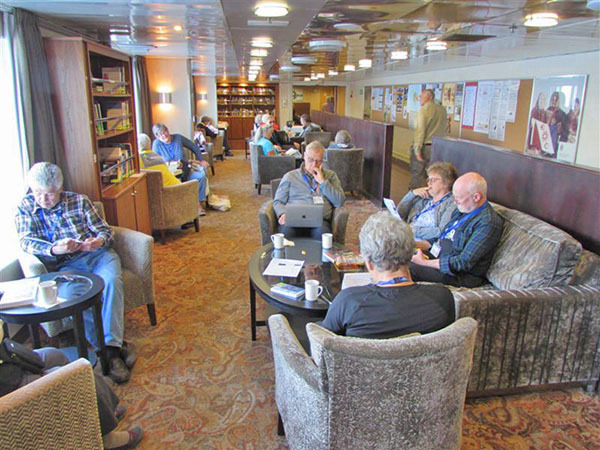 The passage on a 200-passenger expedition ship gave us a unique chance, like sipping a good Scotch, to slowly savor difficult-to-reach communities in the Inner and Outer Hebrides, the Orkneys and The Shetlands. 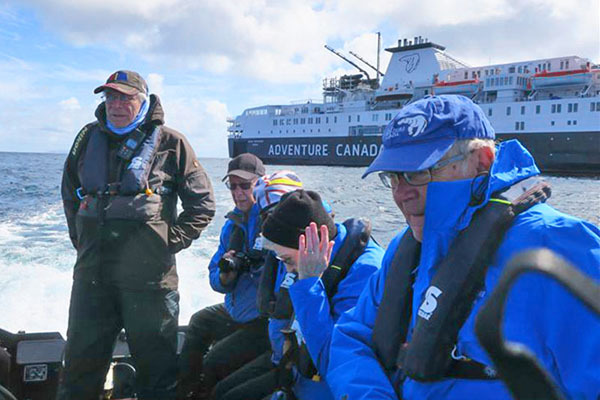 Adventure Canada, with more than 30 years experience exploring by ship some of the more remote places on the planet, began this expedition cruise with an overnight in Glasgow followed by a bus ride to the coastal town of Oban where we boarded the Ocean Endeavour. This comfortable, 35-year-old Polish-built vessel is ice-reinforced for Arctic and Antarctic passages and includes well-equipped staterooms (no balconies) and several spacious lounges for relaxing and daily debriefings by the experienced team leaders and specialists in science, anthropology, geography, and history. The quality of these resource people (most have a Ph.D. or special talents) is remarkable. The ship uses twenty, 10-passenger Zodiacs to explore coastlines and to transport guests to landing spots on the various islands we visited. Every guest was issued a complimentary, blue Adventure Canada waterproof jacket. They proved to be very useful. Our first Zodiac transfer was on Islay, the southernmost island in the Inner Hebrides. We landed on a sandy beach adjacent to Bowmore, one of eight renowned distilleries on this small island. 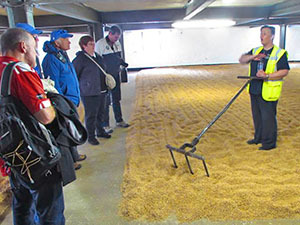 With an abundance of peat, Islay whisky makers are known for their smoky, heavily peated flavors so John took advantage of a Bowmore tour while Sandra took the included Adventure Canada tour to Finlaggan, an ancient Neolithic and Viking ruin that was the seat of the MacDonald clan for 400 years. Both tours were fascinating. The next morning, after a bone-rattling ride in a bucking Zodiac, slashed by sheets of North Atlantic spray and driving rain, we landed on the Isle of Iona, a place of Christian pilgrimage for centuries. In spite of the rain and wind, we loved our visit to the restored Iona Abby near where St. Columba built a Celtic church in 563 AD and where monks produced the exquisite Book of Kells starting in 800 AD. An 8th-century Celtic cross stands outside the abbey. The stormy, very windy conditions continued the next day, so changes had to be made to our itinerary (these are common with Adventure Canada expeditions to remote areas and are handled very well). We stayed on board and enjoyed the Compass Club lounge and its outstanding collection of history and geography books. For dinner that evening many guests, including us, chose the traditional Scottish haggis, tatties and neeps dinner. It was superb. The weather finally cleared for our visit to the westernmost island group in Scotland, St. Kilda (40 miles west of the Outer Hebrides, it’s a UNESCO World Heritage Site). Birds rule the roost (and the land) with abundant colonies of puffins, fulmars and, particularly, gannets. The captain of the Ocean Endeavour brought us close to one sea stack jutting dramatically out of the sea with hundreds of thousands of Northern Gannets clinging to every available square inch. The Isle of Lewis is also the Isle of Harris (on the southern end), famous for its Harris Tweed. 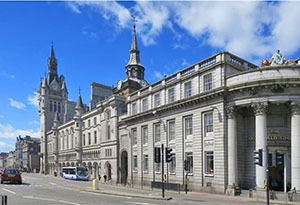 The capital, Stornoway, has the largest Gaelic speaking community in Scotland. We loved the town and its Gaelic heritage, particularly the Victorian castle landmark, and its museum display of several Lewis Chessmen. These 12th Century, intricately carved walrus tusk chess pieces were discovered on Lewis in 1831. Most are now in the British Museum in London, but several remain in Lewis and are worth the climb to the castle. 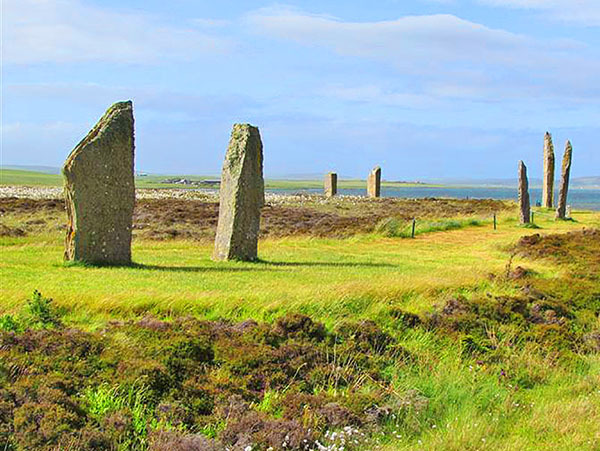 Outside Stornoway, the most stunning spectacle is the ring of standing stones called Callanish. Erected 5000 years ago, they are the most dramatic of several nearby stone circles built for unknown reasons in the Neolithic age. They were a focus for ritual activity during the Bronze Age and are remarkably intact. Because visitors can still walk among them, we found them to be more fascinating and personal than Stonehenge. Ancient history continued to fascinate the next day as we docked in Kirkwall, Orkney, and visited the Ring of Brodgar, thought to have been erected around 2500 BC. 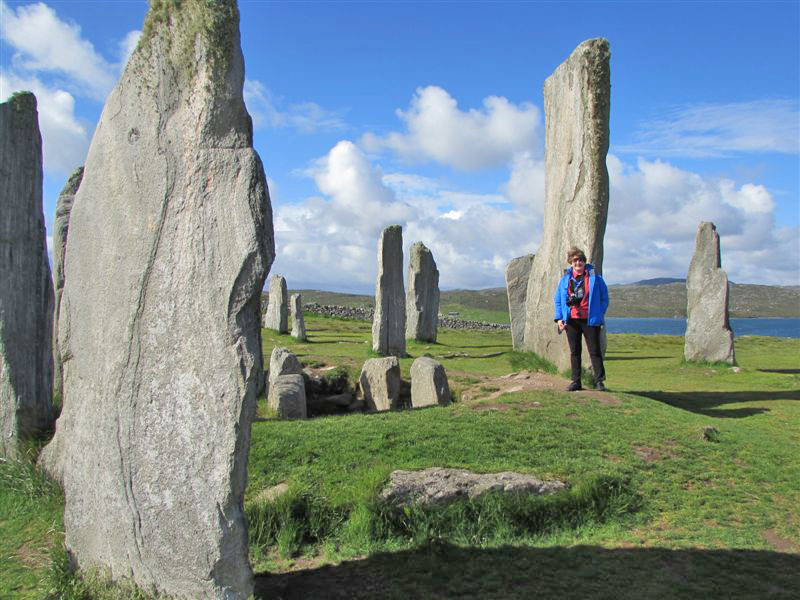 The stones form a huge circle, more than 340 feet in diameter, greater than Stonehenge. More bad weather kept us in Kirkwall overnight but gave Adventure Canada the opportunity for us to visit Skara Brae, the ancient remains of a Neolithic village occupied from about 3180 BC to 2500 BC. This UNESCO World Heritage Site is the most compete Stone Age village ever found in Britain. Kirkwall is also the home of the magnificent 12th Century St. Magnus Cathedral. Of particular interest in the church is the tomb of John Rae, the Orkney-born surgeon and Arctic explorer who discovered the final link (The Rae Strait) to Canada’s elusive Northwest Passage. He solved the mystery of Sir John Franklin and his ill-fated search for the passage. More Kirkwell history is evident at the nearby Highland Park Distillery, founded in 1798. It’s not an Adventure Canada scheduled tour (it should be), so several of us took a taxi to the distillery and enjoyed a full tour (with tasting) of the whisky-making process. 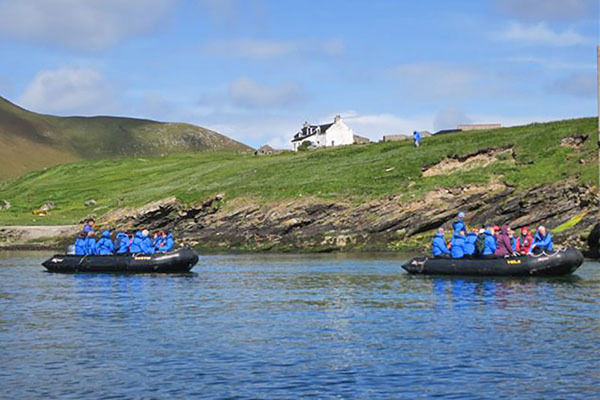 On our last day aboard the Ocean Endeavour, the unpredictable Scottish weather cleared again for a visit to Foula, Shetland Islands, the most remote permanently inhabited island in the UK. 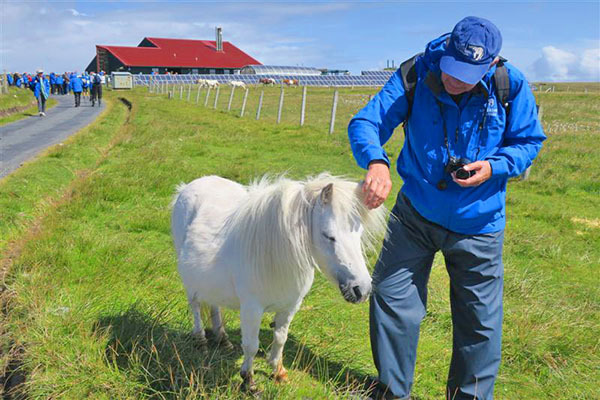 The stark, treeless island covered with peat bogs has many Shetland ponies and sheep but only a couple of dozen residents to tend them. We felt like honored guests as the locals opened up the school for tea and complimentary pastries and offered local crafts for sale. Aberdeen was an ideal city in which to end our Adventure Canada expedition. The city struck us as a smaller, but equally interesting version of Edinburgh. At a local bookstore, we found copies of the Lewis Trilogy, a wonderful series of mystery novels by Peter May about a detective who investigates and solves crimes in Lewis and other remote islands in the Hebrides. Atmospheric and beautifully written, we’re reading them now as they take us back to this most extraordinary area of the UK and our excellent “Scotland Slowly” expedition.